We have all heard the saying ‘a picture is worth 1000 words’. For Canberra-based theatre veteran Chrissie Shaw, this rang true a few years ago during a visit to a Melbourne art gallery. There Shaw was struck by a black-and-white photograph, Madame Bijou in the Bar de la Lune, Paris (1932). This image set her mind in motion: who was the ridiculous and unpleasant woman in the photograph; why was she covered in all those jewels and what happened to her? The intriguing photograph inspired Shaw’s cabaret show, Bijou, a Cabaret of Secrets and Madness, which will soon be debuting at the Street Theatre, Canberra. ‘It has been more than three years work’ Shaw informed me as we spoke about Bijou. After seeing the photograph of Madame Bijou she set about researching the life of its subject. 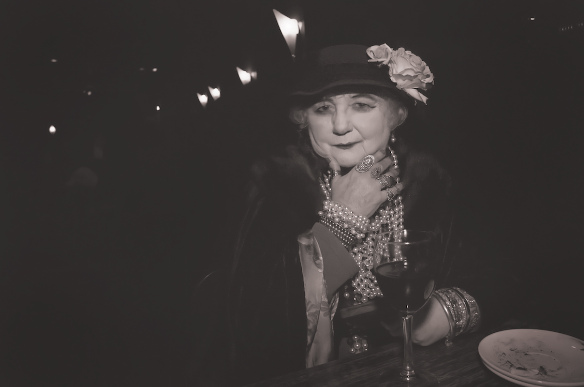 She found out that Madame Bijou was, in fact, a real person, and would have been in her sixties when she was captured by Brassaï (the pseudonym of Hungarian-French photographer Gyula Halász) in a bar in the bohemian Parisian quarter of Montparnasse. ‘Everything that is known about her is part of the story’, Shaw explained, with much of this an intriguing blend of fact and myth. Bijou draws on the cabaret format to creatively tell the story of Madame Bijou. It has an encapsulated plot that begins with Bijou in the 1930s singing her song to anyone who will listen, so to speak, and slowly works backwards through her past. Music, song and dance are used to create an evocative picture of the trials and tribulations that coloured Madame Bijou’s life. The format was selected as a way of ‘peeling off the layers’ and offering a way of understanding the circumstances that led Madame Bijou to become a poor, ruthless and thuggish woman who was immersed in the Parisian demi-monde and fringe dwellers of society. Being a cabaret show, music is a prominent vehicle through which Madame Bijou’s highs and lows are told. Acclaimed vocal coach and accompanist Alan Hicks joins Shaw on stage, and plays the piano man in the bar. Audiences will delight in the ensemble of French music Shaw has selected for the production. Compositions by Satie, Debussy and others are now considered ‘classical music’ yet, as Shaw pointed out, their music was contemporary and somewhat risqué in the early twentieth century. Bijou is the first cabaret production Shaw has created. A veteran of the stage, Shaw has seen her produced seven original plays over the past two decades, worked for numerous theatre companies and, more recently, created and performed in children’s theatre productions. In her spare time, she gives her services as a musical director for several community choirs, amongst other pursuits. Shaw has had a lot of support in bringing Bijou to life. The research and development of the production were supported by the Street Theatre’s Hive and Made in Canberra programs, as wells as ARTS ACT. Part of this support meant that Shaw was able to work with dramateur Susan Pilbeam in translating some of the research she had conducted on Madame Bijou into a cabaret production. Liz Lea also worked on the show, and choreographed the intriguing dance sequences, which range from the Waltz to the Charleston. As I spoke with Shaw I was struck by her enthusiasm for Bijou and the intriguing way in which it came about. It is incredible to think that the fleeting impression of a photograph set off a more than three-year journey of research, creativity and performance that culminates in an innovative cabaret production. The story of the cabaret is almost as incredible as the life – and myth – of Madame Bijou. ‘I want to share the fun… the pleasure of the fabulous music’ Shaw responded when asked of her aims for Bijou. ‘I also want to share Bijou’s story’ she added. While she concedes that a lot of the things explored in the production may not have happened to Madame Bijou, Shaw is certain that most of it did – or could have. Either way, the blurred line between fact and fiction is unimportant, as the strength of the production is seen it its ability to transport audiences into another world and provide a thoroughly entertaining yet thought-provoking night at the theatre. Judged by the calibre of Shaw, Hicks and the rest of the team, not to mention the research and passion behind Bijou, these aims are sure to be achieved. This entry was posted in Art, Arts, Theatre and tagged 1930s, cabaret, canberra, dance, music, paris, piano, singing, theatre. Bookmark the permalink.